The Chronos range of multi bowl hand wash basins are ideally suited for use in shopping centers, filling stations, schools, sports arenas and public restrooms. Taps can be wall mounted or deck mounted onto the basin. Recommended taps to be used are IR activated or self closing manual activated pillar taps. See the tap recommendations below. 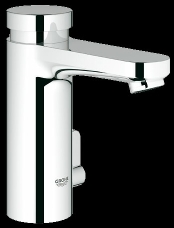 Franke Model CHR02, CHR03 and CHR04 Chronos Ranges of wash Hand Basin. The basins are manufactured from Grade 304 (18/10) Stainless Steel,1,6 mm thick (top) and bowls 1,2 mm thick. Bowl size is 360 mm diameter x 150 mm deep with 40 mm waste outlets. Unit to include a radius to the front and 100 mm apron all round to conceal the bowl and the plumbing. Unit to be fixed to wall using raw bolts with 3 mm Stainless Steel bracket for reinforcement. 3 mm mounting bracket for reinforcement. Self closing water saving pillar tap with hot and cold mixing.